Village of Biron has a beautiful park on South Biron Drive. 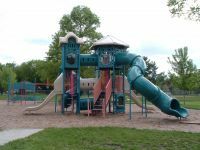 The park provides playground equipment, a baseball diamond, basketball courts, and tennis courts. 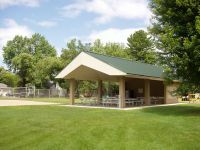 The shelter house is available for rental by calling 715-423-6580. The park is open from 7:00 a.m. to 11:00 p.m. Sunday through Thursday and until 12 midnight on Friday and Saturday. The Village of Biron curfew for anyone under age 18 is 10:00 p.m.
PETS ARE NOT ALLOWED IN THE PARK AT ANY TIME. All dogs need to be licensed annually. The cost is $5.00 per year for a neutered or spayed dog and $15.00 for an unneutered or unspayed dog. Dog licenses for the calendar year must be purchased by March 31st of each year or a $5.00 late fee per license will be charged. The maximum number of dogs and cats shall be as follows: In a single family residential area no residence shall have more than three dogs, three cats or any combination of such dogs and cats exceeding four. Multi-family residential area including the mobile home district - no residence shall have more than two dogs or two cats or any combination of such dogs and cats exceeding three. Enjoy the recreational trail from Kahoun Road to South Biron Drive. No motorized vehicles are allowed. Pet waste stations are installed at each entrance. Please pick up after your pet. Along South Biron Drive, fish from the pier or relax and enjoy the river view from Gateway Park. Please dispose of all trash in the receptacles provided. Please note there is no parking allowed along the road on the designated bike path at all times. The Village has two boat docks on the Wisconsin River. One is located just north of Kahoun Road and the other is located on North Biron Drive. With the Bridgewater development on North Biron Drive currently under construction, the Village hopes to have a handicapped accessible fishing pier, recreational trail, and a boat landing area.